As a growing number of your friends and relatives make the jump to join the van life movement, you may be wondering if it’s right for you. For some people, nothing is more exciting than taking an epic road trip with their family and friends. If you have a passion for traveling, a motorhome might be right up your alley. When driving for many hours at a time, watching the state welcome signs fly by, comfort becomes a big factor. Few vehicles offer as much leg-stretching room as a motorhome. Due to the smart, modern design of today’s motorhomes, everyone in your family will be able to stretch out. Not only will you have plenty of passenger room for the kids and pets, you can also take advantage of the van’s ample cargo space. From hiking gear to tailgating supplies, you’ll be able to pack a lot of extra gear. Luxuries, such as heated and reclining seats, promise to make your journey much more enjoyable. Modern campervans are a pleasure to drive. No longer do recreational vehicles handle like semi trucks. Whether you’re taking a trip to the mountains or headed for the beach, you feel comfortable driving your motorhome anywhere. State-of-the-art responsive steering systems make these vans incredibly easy to maneuver on the road. Many people liken the experience to driving a large SUV. You also shouldn’t overlook a motorhome’s powerful performance. When merging onto a busy interstate, the extra muscle will definitely come in handy. Strong towing capabilities add to a campervan’s overall appeal. Most of today’s models have no trouble pulling a fishing boat, a trailer, or an extra car. Today’s motorhomes allow you to truly unwind. A wide number of state-of-the-art entertainment features are available. This is especially beneficial for you folks who’ll be traveling with children. Integrated video game consoles and high-definition TV screens will definitely help alleviate boredom and prevent that all too common question of “Are we there yet?”. Many proud motorhome owners also appreciate when their van comes equipped with a touch-screen navigation system. The turn-by-turn driving directions will enable you to remain “on track” at all times. Meanwhile, premium sound systems bring another layer of excitement. LED mood lighting is often available as well in many models. Many people are surprised by the affordability of motorhomes. In fact, despite the many additional features, some models aren’t much more expensive than a standard minivan. Most importantly, fuel economy has improved dramatically in recent years. This means you’ll be able to hit the road without overspending on gas. Camper vans also benefit from their van’s durable design. As long as you service it at the recommended intervals, you can typically enjoy a trouble-free performance for years to come. Opting into a standard warranty further protects your investment. If you appreciate riding in a stylish ride, a luxury motorhome will allow you to make a grand entrance and enhance your van’s curb appeal. Most come loaded with a greater number of custom exterior upgrades than standard vehicles. Choose from a number of custom wheel designs. Ground effects give your motorhome an especially sleek profile. Deep tinted windows provide a strong sense of privacy. For most people, safety is a huge priority. Fortunately, modern motorhomes are built incredibly sturdy, meaning you can travel anywhere with an extra peace mind. Powerful disc braking systems ensure quick stops during emergency situations. You also have access to popular driving aids like parking sensors and backup cameras. These are just a jew of the many benefits to owning a motorhome. We’ve only scratched the surface. Learn more about the reasons why people choose campervans over RVs. Want to learn more about the benefits of owning a new or used campervan? 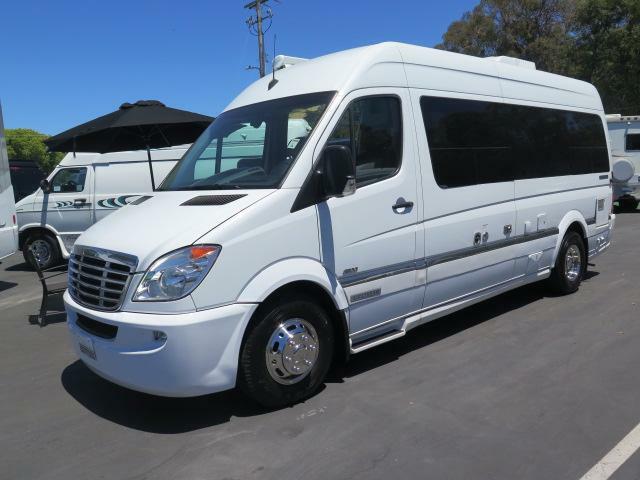 Classic Vans offers the nation’s best selection of new and used motorhomes for sale. Contact us if you need help deciding or have a question. Happy searching!